This two part event is perfect for those looking to break into Philadelphia’s sustainable fashion scene. Part one (tonight!) will feature a panel including SA VA’s Sarah Van Aken, Jamila Payne; National Association of Sustainable Fashion Designers (SBN Co-Chair), Natalie Nixon of the Fashion Industry Management Department at Philadelphia University and Siw Thai Silk’s Susan Firestone. The group will discuss the pros and cons of running a fashion business that includes fair trade and sustainable practices. They will also clue participants in on what eco-minded items will catch the eyes of local buyers. Part two’s panel will also feature sustainable designers who are fighting for a greater eco presence in the fashion world. These working designers will share personal anecdotes and offer attendants tips on starting and ultimately growing their own fashion companies. Part I, Thursday Oct. 7, 6 p.m. – 8 p.m., Part 2, Thursday Oct. 18, 6 p.m. – 8 p.m., CBS Auditorium, University of the Arts, Broad St. and Pine St., Philadelphia, $20 Sustainable Design members, $25 non-members. 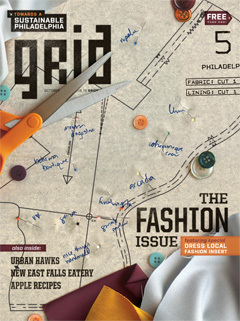 On a broader night, DesignPhiladelphia launches today. Check out the website for details on all the exciting events.